Sometimes your employer also asks you to get certified to impress clients, particularly on service-based companies like Accenture, Infosys, TCS, CTS etc. Believe it or not but having a pool of certified Java developer looks good on any proposal and big clients like investment banks e.g. Barclays, Citibank, and other Insurance giants really value them and help your company to grab contracts. Anyway, when it comes to difference, there is not a huge difference in preparation time for OCAJP 8 and OCAJP 7? The answer is, No. The difference in the syllabus is very minimal and only a few weeks of preparation time is required to cover additional topics added for Java SE 8 certification. OCAJP 7 or OCAJP 8? 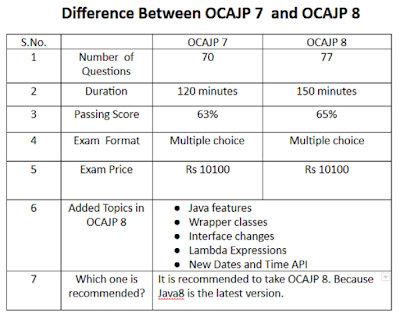 If you wondering about which exam to prepare, I would suggest going for OCAJP 8 because it is based on Java SE 8. No doubt OCAJP 7 is easier to crack because passing score is less than OCAJP 8, the syllabus is smaller then OCAJP 8 and even number of question is less, but Java SE 8 will give you a competitive advantage. Once you become a Java SE 8 certified programmer, you will obviously have a distinctive advantage over other Java developers who might not even hear about Java 8. Since Java 8 is the future, you would expect that most of the new code will be written in Java 8 utilizing the new features of Java 8 e.g. lambda expression, steams, interface changes, and new date and time API. Also, in general, the latest is considered greatest, so going for OCAJP 8 certification is the right decision. The only case, where I suggest you go for OCAJP 7 if you just want a certification if you think that you don't have much time to prepare and you already know Java. You can crack the OCAJP7 exam and earn a certification, but you should be prepared to answer that why you chose OCAJP7 over OCAJP8 in your interview because the interviewer will definitely ask this question, considering why you did a Java SE 7 certification when Java 8 was already available. The OCAJP 7 certification exam is based on Java SE 7 while the OCAJP 8 is based upon Java SE 8. If you look at the full form, the OCAJP7 stands for Oracle Certified Associate for Java SE 7 while OCAJP8 stands for Oracle Certified Associated for Java SE 8. If you haven't used Java 8 yet, then this is also a good opportunity to start learning Java 8 and The Complete Java MasterClass on Udemy is a good place to start with. Since the number of question has increased from 70 to 77 in OCAJP8, so is the duration which is increased by 30 minutes. OCAJP 7 allows you to complete the exam in 120 minutes or 2 hours, while OCAJP 8 gives you 150 minutes of 2 and half hours. So, you get additional 30 minutes to solve additional 7 questions, not a bad deal. This the one aspect which makes OCAJP 8 easier than OCAJP 7 but overall you will find cracking OCAJP 8 tougher to crack than OCAJP 7. If you are worried about whether you can solve all the questions on allotted time then I suggest you practice with Whizlabs's OCAJP 8 Practice Test in exam like situation i.e. sit down in a quiet room with a timer and solve them just like you would do in the real exam. I have done this in past and it improves my speed and accuracy a lot. I also learned how to spot the errors before it's too late. Passing score has also increased from OCAJP7 to OCAJP8. Earlier you need to score at least 63% to pass the exam but now you have to score least 65%,. This means, you have to prepare really well if you don't want to give this exam again and eager to earn the certification in the first attempt. Also, the cost of exam and time for preparation is important. You don't want to waste your $ 250, hence you should try your best to clear the exam in the first attempt. There is no change in the exam format, both OCAJP 7 and OCAJP 8 asks multiple choice question. Some question has one answer, other can have multiple answers. Sometimes you are also asked to fill in the blanks and arranging the code in order. It can be little tricky if you have not practiced such questions. To avoid silly mistakes, I suggest you practice a couple of mock test on with Whizlabs OCAJP 8 Simulator, to familiarize yourself with the latest exam format and different types of questions. Price for both the OCAJP7 and OCAJP8 certification exam is same. Though price varies in different countries, in India cost of OCAJP7 and OCAJP8 is around 10,100 INR, while in the USA it is around 248 USD. Actually, the cost varies between developing and developed nation, hence you will find the same $248 cost converted into local currency on developed nations like Singapore, UK, Europe etc. While the cost of Oracle Java Certification is around 10,000 INR in developing nations like India, Brazil, African nations etc. Since OCAJP7 and OCAJP 8 are based on different Java version their syllabus is a little bit different. You have some additional topics in OCAJP 8 which are based upon new features introduced in Java SE 8 e.g. lambda expressions, new date and time API, default and static methods of interfaces, wrapper classes, and other new Java 8 features. In order to cover all the topics, I suggest you join the Whilzlab's OCAJP 8 Training Course, which is a high-quality course. It not only covers all the topics but also helps you understand the format of the exams and type of the questions you would expect in real exam. There seems a lot of difference but to be honest it's not much. Once you start preparation, the increased number of topics will not matter. Though you need more practice to score well above 65% which is key as Java certifications are costly. You need to shell $250 everytime you give the exam. That's why I suggest you practice hard with Whizlabs OCAJP 8 Simulator, which contains more than 650+ questions on all exam topics and most up-to-date resource for this certification. You will also get chance to see the different type of questions you will expect in the exam. It's also not costly, you will get a lifetime access to just $19 or something. That's all about some key difference between OCAJP 7 and OCAJP 8 certification exam. If you are a Java developer preparing for OCAJP or OCPJP in 2018 then these difference will help you to prepare better. It will also help you to decide which exam you should pursue. It does make sense because Java 8 is the future and you must know Java 8 idioms and coding style to become a Java developer in 2018. Difference between OCAJP and OCPJP Exam? Whizlabs or Enthuware? Which Exam Simulator is better for OCAJP?